If your daughter is anything like mine, there are about a hundred thousand different types of pens and markers in her desk drawer. Her favourites are always lost somewhere in the depths of the piles, and organizing them all is no small feat! We decided to make some pretty jars that matched her room that could sit on her desk and hold her most used items. This is a fun project to do with your child! I'll walk you through the whole process! 1. I picked up four plain glass jars at the dollar store and gave them a good wash in hot soapy water. We gave them a coat of Clear Primer. The primer creates a bond between the glass and the paint. We let them dry a full 24 hours before moving on to the next step. 2. My daughter picked out four colours that matched her bedroom: Peacoat, Full Bloom, Bliss, and Sunday Tea (all from Country Chic Paint). 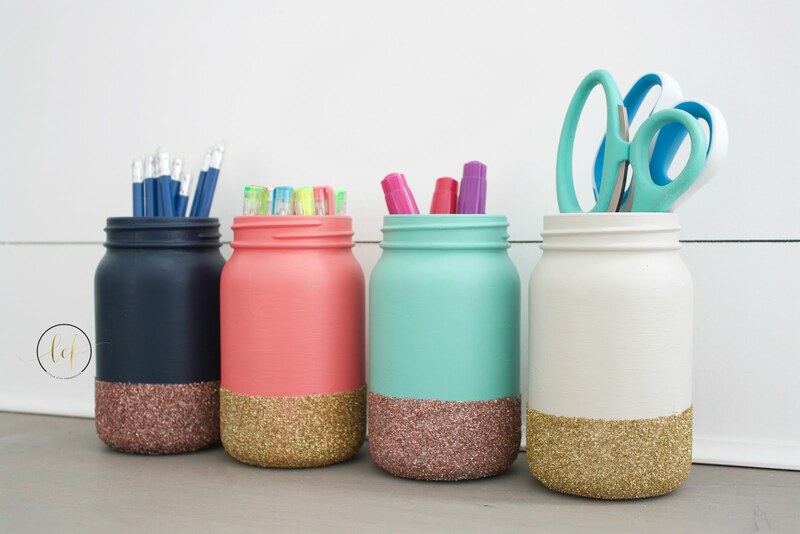 We gave each jar two coats of paint, letting them fully dry in between and after. 3. We measured and taped off a line on the jars as far up as we wanted the glitter to be. We used the Image Transfer Medium as the glue to adhere the glitter. We gave the area to be glittered a good coat of image transfer medium, and then sprinkled the glitter on over a shallow dish. Make sure you only do one jar at a time so that the Image Transfer Medium doesn't start to dry before you sprinkle on the glitter! 4. 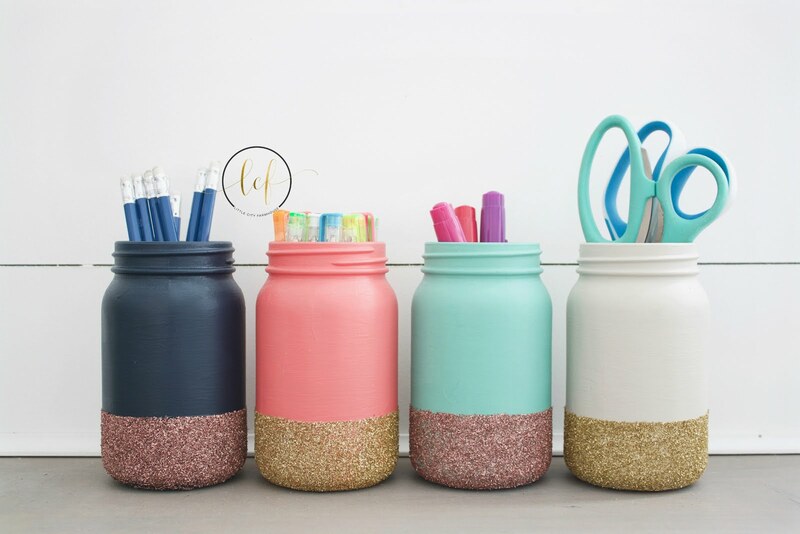 We used the Gold Glitter on two jars and the Rose Gold on the other two. When we were done each jar, we dumped the remaining glitter in the dish back in the jar of glitter to use another time! We carefully pulled off the tape when we were done each jar and set them aside to fully dry. 5. 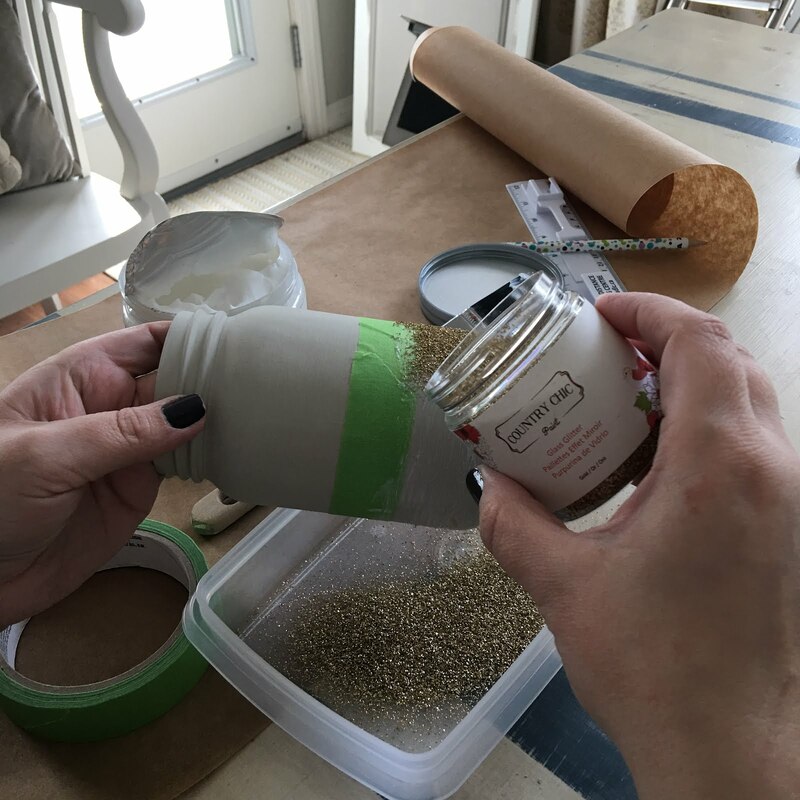 To seal the jars, you can go back over them with the Image Transfer Medium, which dries clear. 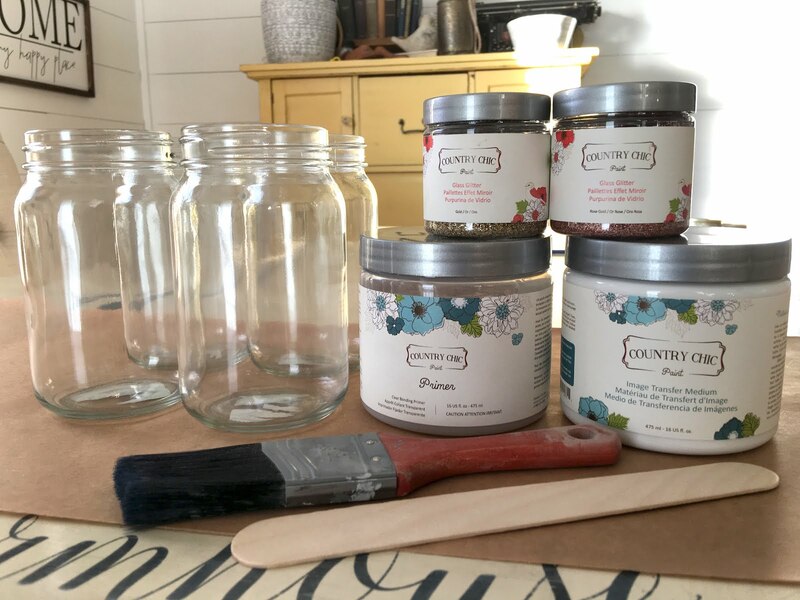 I happened to have Clear Coat from Country Chic Paint in my sprayer already, so I gave the jars three coats of it to seal them. Perfectly cute organization for a girly girl! For more inspiration using Glass Glitter, make sure you are following Country Chic Paint on Facebook! You can follow us there too!